Hello and welcome to our live coverage of the 45th Volta ao Algarve. 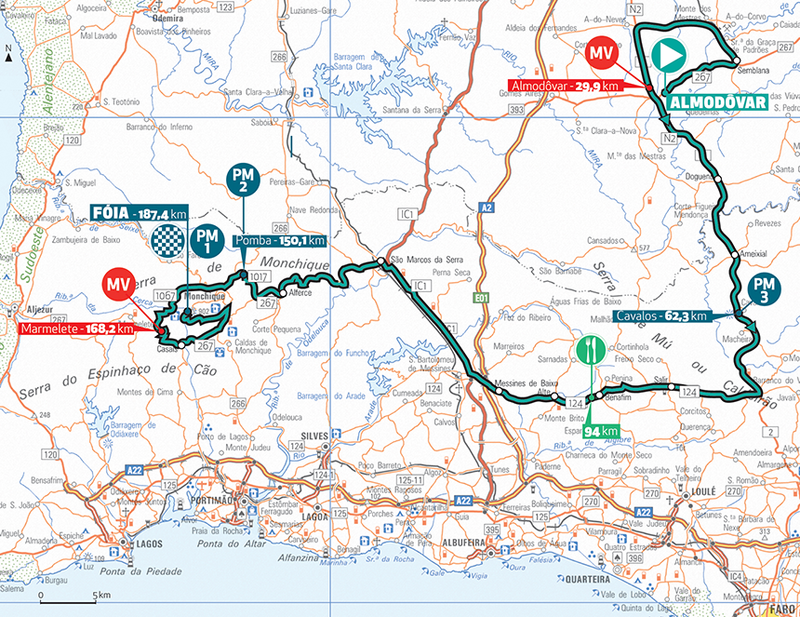 Today's second stage runs 187.4km from Almodôvar to the summit finish at Fóia. Today's stage kicks off in around 15 minutes. Given the summit finish we should see a big shakeup at the top of the overall standings today. A number of strong climbers – including Wout Poels, Sam Oomen, Enric Mas and David de la Cruz – managed to avoid the crash at the end of yesterday's stage and should be in a good position to take over the race lead here. Yesterday we saw Fabio Jakobsen (Deceuninck-Quick Step) take his first win of the season on his first race day. The Belgian was one of around 30 riders who avoided the mass pileup 7km from the end of the stage. Arnaud Démare (Groupama-FDJ) and Pascal Ackermann (Bora-Hansgrohe) rounded out the podium. Here's a map of today's stage. The riders have started stage 2, rolling out from Almodôvar. Two riders didn't take the start today, having been involved in yesterday's big crash. They are Luís Mendonça (Radio Popular-Boavista) and Aleksandr Grigorev (Sporting-Tavira). Six riders are up front at the moment. They are Will Barta (CCC Team), Olivier le Gac (Groupama-FDJ), Brian van Goethem (Lotto-Soudal), Rafael Reis (W52-FC Porto), Bruno Silva (Efapel) and Jesús Nanclares (Miranda-Mortágua). The group has 1:50 on the peloton. The advantage of the break has edged out to over two minutes now. No update on the result of the first intermediate sprint, which they have surely passed through, yet. Silva, Nanclares and Barta were the top three on the first intermediate sprint of the day. The riders have covered 38km in the first hour of racing. They're 24km from the first climb of the day at Cavalos. The situation is stable at the moment, with the break comfortable up the road and the peloton happy with its makeup. Closing in the the first climb of the day now. The break is just under two minutes ahead of the peloton. The third category climb of Cavalos sees Reis take the points. Silva and Nanclares are second and third over the line. The riders head downhill into the valley now, where the feed zone awaits. Almost 90km away, the second category climb of Pomba awaits, ahead of another intermediate sprint and then the final climb to the finish. The gap remains at around the two-minute mark. Not much leeway for the break. Lotto-Soudal are among the teams setting the pace at the head of the peloton. Deceuninck-Quick Step are also working at the front of the peloton. It has been a slow one so far today, with a 35km/h average speed for the first two hours. We're still almost 50km away from the next climb, too. Not a thriller. The six men are all still together up front, and the gap remains around the two minute mark. We're hearing that Dmitrii Strakhov (Katusha-Alpecin) and Riccardo Zoidl (CCC Team) are out front alone on the climb of Pomba. No word on the break, who seem to have suddenly been caught. Meanwhile, race leader Jakobsen has been dropped from the peloton. Now it's Zoidl and his teammate, the Portuguese climber Amaro Antunes, out front. Antunes finished 1:35 down yesterday after getting held up in the crash. Zoidl is working for him, so it looks like a bid for the stage win is on the cards. Antunes finished fifth overall here in 2017, winning the final stage to Malhão along the way. That season he went on to win the prestigious Trofeu Joaquim Agostinho before finishing second at the Volta a Portugal. Last year he made the move to CCC Sprandi Polkowice, and this year is the 28 year old's first in the WorldTour. A chase group has formed. Raul Alarcón and João Rodrigues (W52-FC Porto) are there, as is João Benta (Radio Popular-Boavista) and the Portuguese champion Domingos Gonçalves (Caja Rural-Seguros RGA). Antunes leads over the top of the climb ahead of Zoidl and with it the provisional lead in the mountains classification. The CCC boys are 30 seconds up on the chase group, and have a two-minute advantage on the peloton. Deceuninck-Quick Step are on the front of the peloton now, with Sky up there as well. Zoidl is still pulling Antunes along out front. 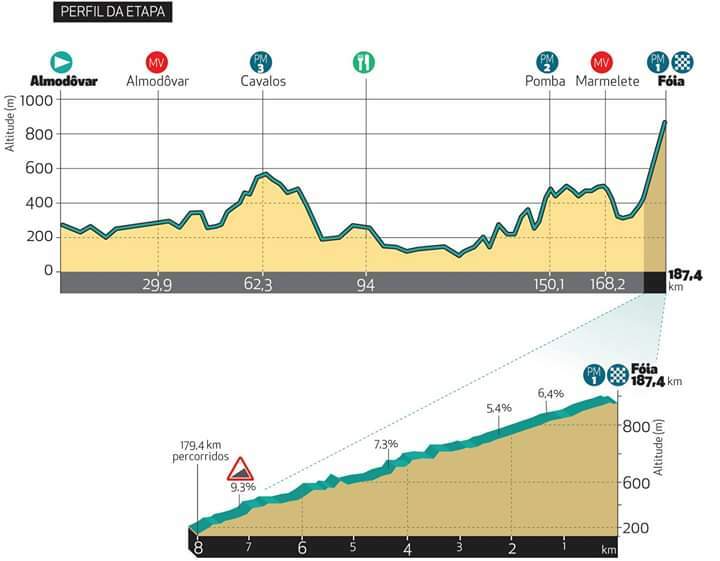 The riders are all on an up-and-down plateau section before the final intermediate sprint (around 12km away) and descent to the base of the climb to the finish line. The chasers have closed in a little on the CCC duo, while the peloton has closed the gap to 1:10. The peloton is strung out under the leadership of Sky and Deceuninck-Quick Step. They're 35 seconds behind the CCC pair now, and the chase group have been absorbed. Zoidl is still working for Antunes. You have to wonder if/when the Portuguese rider is going to go it alone. It looks like the gap is holding. The leaders are just a few kilometres away from the start of the descent. Zoidl leads Antunes over the sprint point. As the leaders start the descent to the foot of Foólia, it looks like there are around 40 riders left in the peloton. As the leaders start the descent to the foot of Fóia, it looks like there are around 40 riders left in the peloton. And the peloton catch Zoidl and Antunes on the descent. All back together now. Enric Mas (Deceuninck-Quick Step) and Wout Poels (Sky) will be among the favourites to win this stage, based on the work their teams have put in today. Neilson Powless (Jumbo-Visma), Sam Oomen (Team Sunweb) and David de la Cruz (Sky) are also contenders for the stage who lie equal on time with the race lead. UAE Team Emirates have Fabio Aru and neo-pro Tadej Pogačar as options, though Aru is 1:05 down on GC. Meanwhile, Trek-Segafredo's Gianluca Brambilla is also 1:05 down. Patrick Konrad (Bora-Hansrohe) is over four minutes down, but is another man to look out for. And Amaro Antunes (CCC Team) could still have a go despite the energy he's already expended. The peloton are about to hit the bottom of the climb now.Deceuninck-Quick Step are up front, while UAE Team Emirates and Lotto-Soudal are moving up. Team Sunweb and Cofidis are up there too now. The peloton have hit the bottom of the Alto da Fóia. Numerous riders are being shot out the back of the peloton already. No surprises yet, though. Sky are on the front now, with Dylan Van Baarle and Tao Geoghegan-Hart riding for Wout Poels. Raúl Alarcón (W52-FC Porto) is dropped after his earlier efforts. UAE Team Emirates have Valerio Conti and Tadej Pogačar near the front. Fabio Aru must be further back in the group. No moves yet. Sky are pushing the pace. Van Baarle peels off and Geoghegan Hart takes over. There are around 25 riders in the lead group, though riders are dropping off all the time. The leaders hit the steepest remaining section of the climb – a kilometre at 7%. There are still around 20 riders in the lead group. Brambilla, Mas and Antunes are the next riders in line after the Sky train. Meanwhile Aru loses the wheel at the rear of the group. Geoghegan Hart, de la Cruz and Poels are the remaining Sky riders. Søren Kragh Andersen (Team Sunweb) and Brambilla are the next to drop. 11 riders left up front, including the three men from Sky. Antunes is having a great day – he's fifth wheel. Mas, Pogačar, Simon Špilak, Simone Petilli, João Rodrigues and José Herrada are also there. More whittling down. There are five men left as de la Cruz and Poels lead. Stunning attack from the CCC man. He's riding into a headwind. Oomen takes it up at the head of the chase group. Antunes has around 5 seconds with four chasing - Poels, Oomen, Pogacar, Mas. Antunes is brought back and Pogacar attacks to the line! Tadej Pogačar takes the win! He timed his attack just right. Poels and Mas round out the podium. It's the first pro win for Pogačar, who won the Tour de l'Avenir last year. Ooomen and Antunes took fourth and fifth on the stage. Pogačar, Poels, Mas, Oomen will be the new top four on GC. "I feel like I'm dreaming. First victory in the WorldTour so this is the best day on the bike. I'm really happy. "Now that I have the yellow jersey I will do everything with my team to keep the yellow jersey until the end. "Tomorrow in the TT I will try to put everything on the road and we'll see how it goes. "The Tour Down Under was a great experience, a great race and great preparation for the next so I think it was a good step. "One of the main goals is California. I don't know - we'll see." It will be interesting to see how Pogačar fares in tomorrow's time trial, his first as a pro. With Poels lying just one second back, it looks likely that the Sky man will take over the race lead, but it's another new challenge for the Slovene. Still, a great victory for the neo-pro today, whatever happens during the remainder of the race. And he certainly showed up nominal team leader Fabio Aru, who hasn't looked the same rider since joining UAE Team Emirates. And that's it for me today. Our full report and results are coming soon. I'll be back tomorrow for the 20km time trial in Lagoa.